The first year of your child's life is such an exciting time filled with so many first, including their first birthday and their first birthday photo session. Like their party, many parents want to choose a theme for the first birthday photos too. Which is great because we specialize in unique and custom themes for all of our photoshoots here in the studio. When it comes to choosing your child's it doesn't have to be complicated. For instance, one client I had chose the theme Vivian and Co (a nod to Tiffany and Co) for their daughter's newborn photos. So for her first birthday, they kept with the same theme to show how much she had grown! Personally, I love Toy Story. 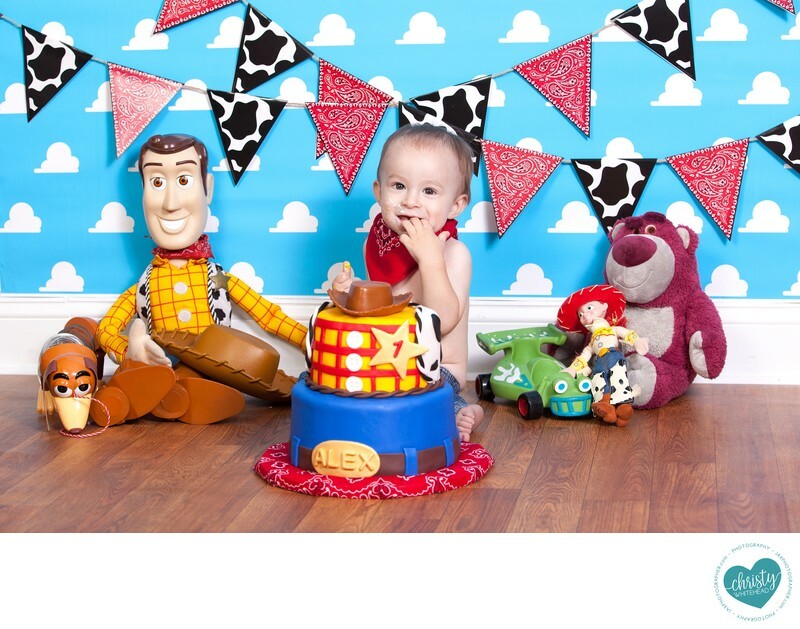 I love Woody, and of course who doesn't love Tom Hanks, just the whole thing, so when my son had his first birthday session, it had to be with my favorite Pixar movie! He looked so cute in his little bandana necktie. I hand designed the backdrop myself. The cake artist did a fantastic job making that smash cake too, it couldn't have turned out any better! Other classic themes include Winnie the Pooh and Mickey and Minnie. You can also opt for colors like blush and rose gold or rainbow.